Fire ants are small, stinging ants in the taxonomic order Hymenoptera and the genus Solenopsis, which also includes many species of ants who don't sting. The Texas Native Fire Ant. Despite their mighty stings, fire ants are very small in size. Adult fire ants average only about 3/32 to 1/4 inch (about 2 - 6 mm) in length, although there is considerable variation in size even in the same colonies. Most fire ants are reddish in overall appearance, with brown heads and dark markings on the abdomen. Some have bodies that are closer to black, however, and even individuals in the same colony may have slightly different coloration. All four species of fire ants in the United States are quite similar in appearance, behavior, and control, making it difficult even for entomologists to tell them apart. Fire Ants build mounds in the soil that range from less than a foot to several feet (about 0.25 meter to one meter or more) in diameter, and from a few inches to more than a foot (about 0.1 to 0.3 meter) in height. Some nests may appear almost flat and even with the surrounding surface, however. There is also an underground portion of the nest that may extend farther downward into the soil than the visible part extends upwards. It's not unusual for people to accidentally step on a fire ant nest that they didn't even know was there, usually with very unpleasant consequences. The main purpose of fire ant mounds seems to be temperature regulation. Layers of decaying organic matter in the mound enable the nest to be maintained at a higher temperature than the ambient environment. 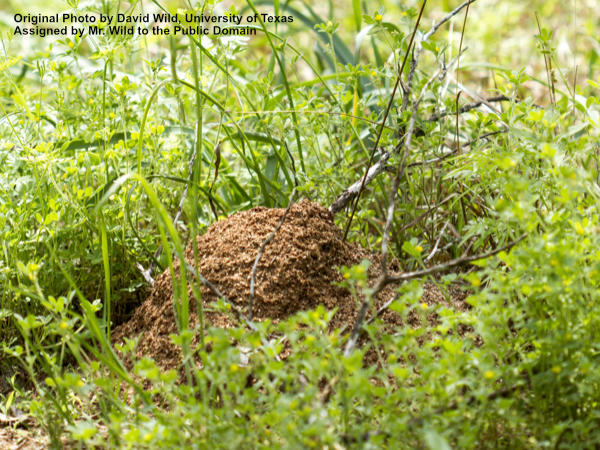 Fire ants may also build soil nests above the surface of the earth. They seem particularly fond of nesting in electrical boxes, air conditioning housings, abandoned cars, generator housings, and other protected, man-made voids. Fire ants are important pests both of agricultural crops and to people and domestic animals, especially in the Southern United States and points south. Fire ants feed voraciously on plants and can cause significant economic damage to farmland, forage fields, and wild areas. They also are a hazard to grazing livestock. They rank among the more important agricultural pests in the United States. Fire ants can also inflict numerous and painful stings to humans, livestock, and wild animals. Indeed, numerous animals and some humans die each year from stings inflicted by fire ants. Besides being quite painful and potentially disfiguring, fire ant stings can trigger toxic or allergic reactions, and produce irritation and pustules which increase a victim's susceptibility to infection. In some cases, fire ants have been known to attack in such great numbers as to kill, especially when the victims were very young, elderly, or otherwise unable to escape. 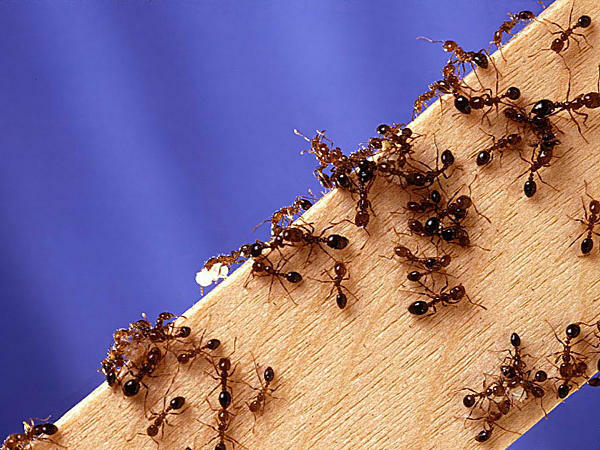 Even a small number of fire ant stings, however, can be fatal to someone who is allergic to insect stings. There are several broad-based programs on the federal, regional, and state levels to combat the spread of fire ants. So upon discovering a nest of fire ants, the first thing you should do is inquire with your state's Cooperative Extension department to see if there are any special procedures you should follow or any government-sponsored fire ant control services available to you. The regulations regarding specific control measures also vary from state to state. In some states, the government will send someone over to take care of it for you. In others, you are required to treat the problem yourself or have it treated by a qualified pest control operator. Because of the risk associated with fire ants and the difficulty in treating them, Scarafaggio.info recommends that you consider professional treatment for fire ants. The first and recommended option for do-it-yourselfers is to bait with a granular fire ant bait. Granular products are easier for the do-it-yourselfer to use, are less hazardous, and do not require expensive application equipment. Advion Fire Ant Bait and Extinguish Plus Fire Ant Bait are two of the better ones as of this revision. The second option is to treat the nest with a liquid insecticide that is labeled for fire ant control. Liquid treatment works more quickly than baiting, but it is more difficult and more hazardous. Large nests may require specialized equipment and several gallons of insecticide to achieve control. Most liquid insecticides labeled for fire ant control contain fairly toxic compounds, need dilution and mixing, and require specialized application equipment, making them more difficult and hazardous for untrained individuals to apply. They also have greater environmental hazards. Baits are more effective than ever now, so liquid fire ant treatments should be reserved for situations in which immediate control is needed. Because state laws vary, we I also suggest that you contact your state's Cooperative Extension department for more specific instructions and chemical recommendations. Always read, understand, and follow all label instructions when using any pesticide product.